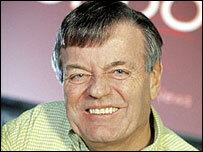 Tony Blackburn (born 29 January 1943 in Guildford, Surrey) is an award winning English disc jockey, who broadcast on the "pirate" stations Radio Caroline and Radio London in the 1960s and was the first presenter to appear on BBC Radio 1 in 1967. In 2002 he was the winner of the ITV reality TV programme I'm a Celebrity... Get Me Out of Here!. I've been a vegetarian since I was four. We were on holiday at a farm and I realised I was eating what I'd been looking at the day before. Born in Guildford in 1943, the son of a doctor, Blackburn was always a mass of contradictions. He was the clean-cut kid, born into a professional middle-class family but who became a lifelong vegetarian in childhood for unashamedly ethical reasons (the cruelty issue), a singer, guitarist and songwriter who was trying to be Perry Como, but ended up as a DJ on pirate radio. As a vegetarian, Tony doesn't like the way animals and insects are used in the trials. He added: "The show is more interesting with the interaction with the people.